We've just designed and raised a nice set of 4 scissor trusses, 2 of which sit over a fully glazed wall frame as shown here. This was always going to be a job for Douglas Fir, not only because the customer specified it, but also because its inherently more stable nature is arguably better suited to this kind of work. It's lighter weight also meant we could raise the trusses by hand rather than needing a crane and the extra expense that brings. 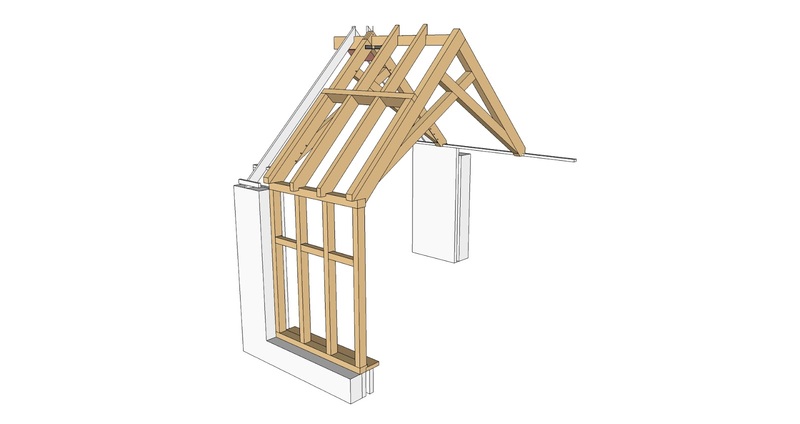 We're also looking at making an adapted scissor truss for the glazed gable frame. It'll need some interesting shaped pieces of glass and some careful detailing, but will make for a really nice light source and intersting feature in the gable. As always, the site is a work in progress and doesn't warrant photos yet...but some day I'll be back there to see it as a finished work.